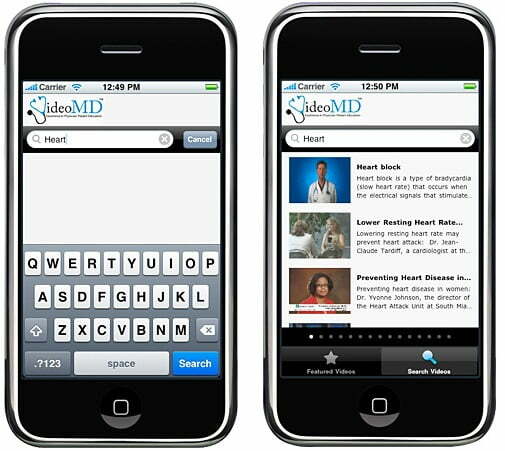 VideoMD.com is a premier resource for medical quality videos and articles written by highly revered doctors and surgeons. The website was built by Pulse in 2008. Looking at the runaway popularity of iPhones, there was a need to port the website into an iPhone app so videos can be played over a 3G or Wi-Fi connection. The application was built using Xcode for maximum usability and compatibility with cell phone networks as well as wifi broadband connection. The system that parses videos on the website was upgraded to enable streaming to mobile devices over an Edge or 3G connection. The system switches the video quality from high to low depending on the bandwidth available.